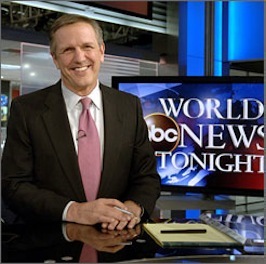 Charles Gibson, who has helmed ABC's World News since May 29, 2006, will be stepping down and retiring from full-time employment with the news division, the network announced Wednesday. Succeeding him is ABC veteran and Good Morning America co-anchor Diane Sawyer, leaving two of the three longstanding network dinner hour newscasts in the hands of women anchors when she takes charge of World News in January. Katie Couric has presided over the CBS Evening News since September 5, 2006, when she made history by becoming the first woman to solo in "The Chair." In an email to ABC News staffers, Gibson, 66, said, "It has not been an easy decision to make. This has been my professional home for almost 35 years. And I love this news department, and all who work in it, to the depths of my soul." During a March 2008 stop in Dallas, Gibson hinted at a possibly early retirement during an interview with unclebarky.com. ABC News president David Westin said that he and Gibson had discussed the matter for several weeks, and that Gibson "has persuaded me that this is both what he wants and what is best for him." Gibson had been co-hosting GMA with Sawyer before agreeing to helm World News "during a difficult and turbulent time," Westin noted in an email to staffers. The program's co-anchors, Bob Woodruff and Elizabeth Vargas, had been expected to head World News for years to come. But Woodruff was seriously injured while covering the war in Iraq and Vargas stepped down after an unplanned pregnancy. Gibson's World News and NBC's Nightly News, anchored by Brian Williams, for a while waged a seesaw battle for ratings supremacy. But Nightly News lately has re-taken the stop spot and widened the gap over second-place World News. Last week, Nightly News averaged 7.9 millon viewers while World News had 7.1 million. Sawyer, 63, has been co-anchoring GMA for the past 10 years. On Wednesday's program, she could be seen cooing over a concert appearance by Whitney Houston, whose comeback CD is new in stores. Couric also rose from the softer early morning ranks, becoming famous on NBC's No. 1-rated Today show before moving to CBS News. "Diane Sawyer is the right person to succeed Charlie and build on what he has accomplished," Westin said in the ABC email before lauding her hard news accomplishments. "We are fortunate to have a journalist of Diane's proven ability and passion to step into the important position of anchor of World News. She will continue with her documentaries in her new role." Westin said the network will make further announcements "well before any changes are made" on GMA. "We are fortunate that both Charlie and Diane will remain with their current broadcasts for the next four months," he said.